As I mentioned in the last couple of podcast shows, this week 2 buddies and I are heading on the road trip of road trips. All three of us are piling into a 2007 Sierra quad cab and will travel from Ames, IA to Bloomfield NM, to visit Allison Customs and then on to the Barrett Jackson auction. The entire trip will take 5 days and will cover just over 3000 miles. In between there will be plenty of greasy food, stupid jokes, and hijinks a plenty. We’ll all be sharing driving duties, which is usually something I stay away from if I can. I hate to ride in cars for the most part (I prefer to drive), but the guys that I’m going with can all wheel pretty well so it shouldn’t be a problem. They love to drive as much as I do, anyway. The beauty of it all is that this is a legitimate work trip, so it’s deductible! While that alone is not a good reason to start a business, it sure is a nice perk. I’ve been constantly surprised in my business how many of the things that I do that are “fun” are actually work related, since car shows, race events, etc. are all things that are “part of the job.” If I could somehow now figure out a way to get everything done in under a bazillion hours a week things would be just about perfect! Jeff Allison, my Chevelle body, and a giant BFGoodrich. Awesome. The first stop on the trip is Allison Customs. We’re going to visit Jeff Allison there, see the progress on my Chevelle, and shoot some video for an upcoming production we’re creating on the miraculous story that has evolved since I received his call a year ago to restore the car for free. I’m so excited to see my Chevelle that I can’t stand it, and while the next major steps on the build really can’t occur until we’re able to secure good sponsorship on several key areas (LS engine, AC/heat, rear end, wheels, etc.) I definitely believe that it will all happen. Our big goal is to have the car running and driving by the 4th of July for the Good Guys Heartland Nationals and then to get her into the SEMA Show, some how, some way. Right now though I really can’t wait to just see what my Chevelle looks like with all of the body mounts intact. I’ve never seen that before. Ever. Next on the trip will be our final destination; Barrett-Jackson. While BJ has multiple auctions throughout the course of the year, this is the big one that even non-car people know about. Bret Michaels from Poison (or “Rock of Love” for you younger kids) will be there, and several other celebrities will as well. 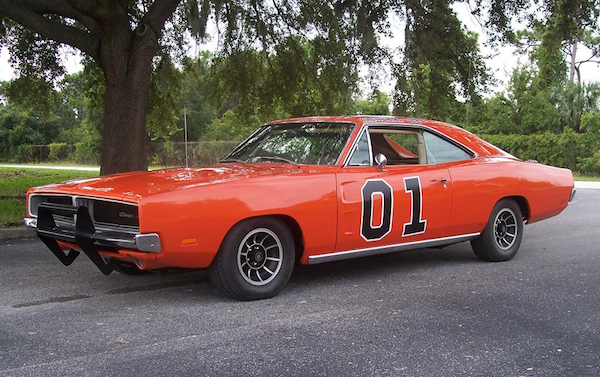 Of course, the biggest celebrity that I’d like to meet is the very first General Lee ever made, but my big goals for the trip are to meet a lot of people, make some connections, and keep finding ways to stay in business while chasing some seriously fun dreams. At the same time I’m excited as ever to spend 5 days palling around with some buddies, so it’s win-win! Stay tuned for updates on The MuscleCar Place Facebook page. I’ll do my best to keep little snippets up regularly. Unfortunately I will not be able to produce a full episode of the podcast show this week due to the trip, but I’ll have PLENTY to share when I get back. Here’s hoping that the trip goes well and that I don’t slip up and buy Lee 1!